Bates Footwear's new footwear lineup delivers what soldiers are looking for. 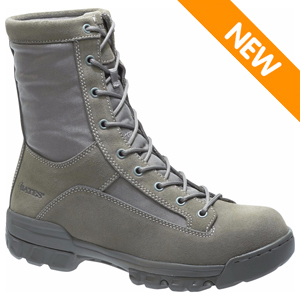 The Bates E08694 Men's Ranger II USAF Sage Green Hot Weather Boot is designed for U.S. Air Force Airmen looking for a dependable hot weather boot for ABU wear. The Bates E08694 features famous Bates construction widely known for maximum comfort in the field. This boot features an high quality upper constructed of 100% pure cowhide leather and ballistic nylon for durability and light weight. Comfort features such as a shock absorbing EVA midsole and moisture wicking lining make long duty shifts easier on your feet. This meets or exceeds all performance requirements of the USAF as well.